By Dan Ambrose: Former WBC middleweight champion Sergio Martinez may wind up getting a title shot against the newly crowned WBC middleweight champion Julio Cesar Chavez Jr. The World Boxing Council president Jose Sulaiman reportedly is saying that Chavez Jr. has a voluntary defense of his WBC title for his next fight but after that Chavez Jr. must face Martinez or else risk having his title stripped from him. I wouldn’t get excited if I were Martinez. 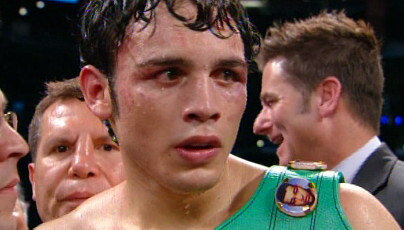 It doesn’t matter if the WBC says that Chavez Jr. has to fight Martinez. I don’t believe Chavez Jr. will get anywhere near Martinez. His promoter Bob Arum would have to be willing to put Chavez Jr. in with Martinez for the fight to happen and the chances of that occurring are slim and none. If the WBC pushes the matter, which I find it hard to believe they would, Chavez Jr. will likely vacated the belt and leave Martinez to fight for the title against the number #1 WBC contender. Chavez Jr. would then be off the hook for what would have been a sure beating. Chavez Jr. then could go after either IBF champion Daniel Geale or WBA title holder Gennady Golovkin. If Chavez Jr. comes into a fight with someone like Golovkin weighing 180s like Chavez Jr. did the night of his fight with Zbik, it would be hard for the Russian and Chavez Jr. would likely win another title. Martinez can hope for Chavez Jr. to fight him but I seriously doubt it.